I never get these challenges in on Saturday night, they are becoming a Sunday ritual. 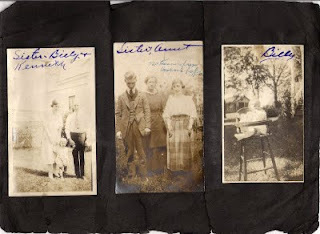 This week Randy Seaver of the Genea-Musings blog presented the challenge to list all of the ancestors we have met and include information about them. Randy was able to list eight ancestors and assumed that was on the low side. It will be interesting to see the highest number of ancestors that are posted. I am on the low end of the low end with only having met three of my ancestors! This is a page from the photo album that was my Grandpa Allens. While I am thrilled to have the photo album and thrilled there are names of who is in the photo...it is sad that the names are on the front of the photos!! Please do not write on the front of photos! Below is my response to the Genea-Musings blogs Saturday Night Genealogy Fun challenge. I started my genealogy research in 2001 with one goal in mind...find my paternal grandfather. I have done that and picked up a couple of great-grandfathers along the way! My current goal is to fully document as many generations as I can with evidence supporting my pedigree. I hope I have another 30-40 years to work towards this goal, but one just never knows. My parents both died in their mid 70's, I hope I have that and more. My research has come in bits and pieces. I tend to spend more time on genealogy in the winter months. Research time also has revolved around family demands such as school activities and sports. My son leaves for college in 12 days! No more football games, baseball games or Booster Club meetings! I anticipate having more time to not only research, but expand my knowledge in genealogy by attending more classes and seminars. The next item on the January checklist that I do not have a check mark for is to: Make four basic categories and sort all the loose papers, documents and photos into one of those categories. I did modify the categories to suit my research style. I have five categories, I can't do without a "miscellaneous" category! Next item is to replace any missing or lost office supplies. I am in good shape with folders, labels, etc. However, to the lady who bought my 3-ring binders during the city-wide garage sale August 1st...you are going to need to bring those back for a refund! What was I thinking selling those???? I am now into week two of Dear Myrtle's checklist for January. Create a surname notebook for each major surname. Time to visit Office Max for more 3-ring binders! I printed off (yes waste of paper in this digital age but I am still old school about some things) Dear Myrtle's Jan - April 2009 Organization Checklists. I've went through each month and checked off the items that I have already done and highlighted those that are still to do. Guess what...I have more highlights than check marks! Not surprising, but I'm not at a concerned point yet either. Many of the to-dos include making purchases of various supplies, which I may or may not do depending on cash flow. I may choose to improvise with the supplies I currently have, which will add more check marks quickly! Now it's time to go back through the checklists and focus on the highlighted items! Ah the dreaded task of organizing the unorganized! I will say that I do not have a huge pile of unattended documents, notes or photos laying on a desk or table somewhere. Everything is SOMEPLACE! Documents are either filed in a three-ring binder, or in a file folder to be reviewed. Most, 90%, of my documents are scanned but only about 50% of my photos. Before I start patting myself on the back though, I still have to remember there is no set organization to my genealogy material. If a researcher contacted me on a common family line I may get lucky and find that I have the data input into my genealogy software and an electronic copy of the document attached to the ancestor in question. What are the odds of me being this lucky? I wouldn't bet the farm! I've found several online sources to assist with getting things in order, even a couple of videos are on YouTube. However, I've decided I like the checklists I found on Dear Myrtle's blog. She has a month by month checklist (started in January and I'm what 8 months behind?) that is broken down into weekly tasks. I like that! Rather than facing a large project and trying to make sense of it in one fell swoop, Myrtle breaks it down into manageable pieces. That is my goal each week to work on a task as suggested! We will see how far I get and how quickly! Just back from the MoSGA annual conference held in Jefferson City, MO. Julie Miller, CG was the keynote speaker and had talks on several topics including search engines (more out there than just Google), military records and naturalization records. All were very informative and Julie is a great speaker! My two favorite sessions were presented by the same person, Michael Strauss, AG. Michael talked about historical maps in one session and the CCC in another. In the historical map session Michael demonstrated how to use panoramic maps and Sanborn maps in conjunction to create an image of where our ancestors lived. The selection of historical maps is much larger than I expected, including draft registration maps and election maps. I can't wait to start using these resources! The Civilian Conservation Corps has a wealth of detailed information available. The trick is getting it! Records are held by the National Archives, however, there is not an index. You must write to the National Personnel Record Center requesting information, they will get back to you on whether or not they have a file and what the cost will be (could be $60 - $100!). There are other records, besides the individual records, that can provide genealogical information such as camp inspection reports. My father was in a CCC camp in Arkansas, I have a photo I will get scanned in and post. I'm looking forward to requesting his file (hopefully on the $60 end!) and see what they find! I met several people at the conference that I really enjoyed visiting with. I will make this comment simply because it has been in the blog headlines lately...the youth movement was lacking at this conference! Keep in mind this was a small state conference but there were approximately a dozen in our 40's, and maybe a handful younger than that. One topic that was missing from the speaker line up was technology of any kind which was disappointing. MoSGA is having a call for speakers for their 2010 annual conference, I hope they will receive a response from some of the more techo/social media type speakers! My father served in the Army from April 25, 1942 until September 14, 1945 in the 1005th Signal Company. While going through paperwork, left behind by my father, I found his separation papers. I sent a copy of those to the National Personnel Records Center in St. Louis, Missouri requesting information on his service activities. I received a reply stating that due to the fire at the records center in 1973 the separation document I had provided more information than they could (and they were happy to have the copy I sent). Additionally, they forwarded my request for information to the Army with an Authorization for Issuance of Awards. Imagine my excitement as I opened up an unexpected package containing the following reissued medals: The Good Conduct Medal, Victory Medal, World War II, and European-African-Middle Eastern Campaign Medal. I was very excited to open that package and surprised how quickly I received the medals! From the time I sent my initial letter until I received the medals four months had passed. I thought that would be the only information I would receive. I was wrong. Ten months later I received another package from the Department of the Army Heritage and Education Center. My request for information on my father's military activity had been forwarded to them also. This is the request that keeps on giving. 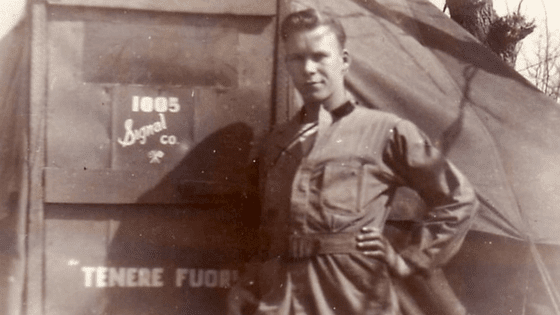 Contained in the package from the Army Heritage and Education Center was historical data on the 1005th Signal Company that had been found on microfilm. 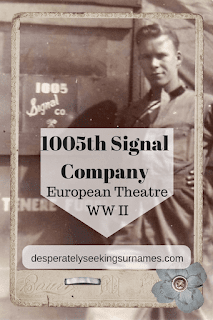 While these documents do not mention my father specifically, they do track the movements of the 1005th from February 24, 1943 until June 12, 1946. This history has allowed me to put the army photos I have in a more correct chronological order. My father had written on the back of the some of the photos with the name of the place but not the date. A simple request for information yielded me more than I expected to receive and it was certainly worth the wait!